The NoBowl feeding system for cats was designed to mimic the hunting cycle, encouraging exercise and better mental health. 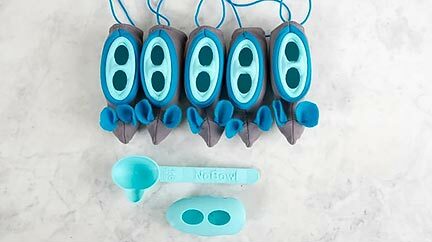 Created by veterinarian Liz Bales, the NoBowl system is made up of five small plastic containers that hold the food and five small covers that look like a mouse. The food is placed in the container and covered with the ‘mouse skin,’ and then the containers are placed randomly around the house—encouraging the cat to hunt its food. According to the developers, cats who were fed using the NoBowl became friendlier and even lost some weight.